Update: MCX got subscribed 54 times (4.5 till 2nd day), with QIB 49 times (3.68); HNI 150 (1.9) and Retail 24 (6.9). Allotment price has been fixed at 1032. From a target of 663 crores, the process has generated 36,000 crores !! I have to admit to readers that the response to the IPO was beyond my expectations. Particularly in HNI category, where everyone seems to have jumped in on the last day. This is bad news – as share allocation will vary from 10% to 0, giving very small absolute gains to investors. Bullish sign: This late surge reminds me of the frothy periods in 2007 and 2010 when many IPOs were heavily oversubscribed. MCX shares is definitely going to take off on listing. This IPO will be remembered for signalling the start of the 2012 revival of Indian markets. Today is the last day to apply for this IPO. Update: MCX got subscribed 4.5 times till yesterday evening, with QIB 3.68 times; HNI 1.9 times and Retail 6.9 times. The subscription limit for Retail is 2 lakhs; and >2L is category HNI. I do not think there are any other issues/ challenges with applying under HNI. While applying, ensure you tick this category in the form. Before you proceed, do check if your Trading account supports HNI. For Retail, to maximize subscription, bid for 192 shares at cut off (likely 1032) for a total application cost of Rs 1,98,144. For HNI, work backwards from the total amount you wish to invest, over 2L, and calculate your number of shares applied for. The MCX is an electronic commodity futures exchange, currently the largest Commodities Trading (CT) platform in India, with an 82% market share. MCX offers more than 40 commodities across segments such as bullion, ferrous /non-ferrous metals, energy, and a number of agri-commodities, for CT on its platform. MCX has over 2,100 registered members operating over 247,000 terminals across India. MCX is the fifth largest CT exchange globally. Other Indian exchanges are National Commodities & Derivatives Exchange (NCDEX), National Multi Commodity Exchange (NMCE), Indian Commodity Exchange (ICEX) and ACE Derivatives & Commodities Exchange. Financial Technologies – FT – is a software/ exchanges/ ecosystem company promoted by Jignesh Shah. It is listed (Financial Technologies), and Market Cap is 4200 crores. The FT stock has been very volatile, rising to over 3000 compared to today’s 910, due to the excessive excitement around MCX, as well as the general market euphoria in FY 2007. 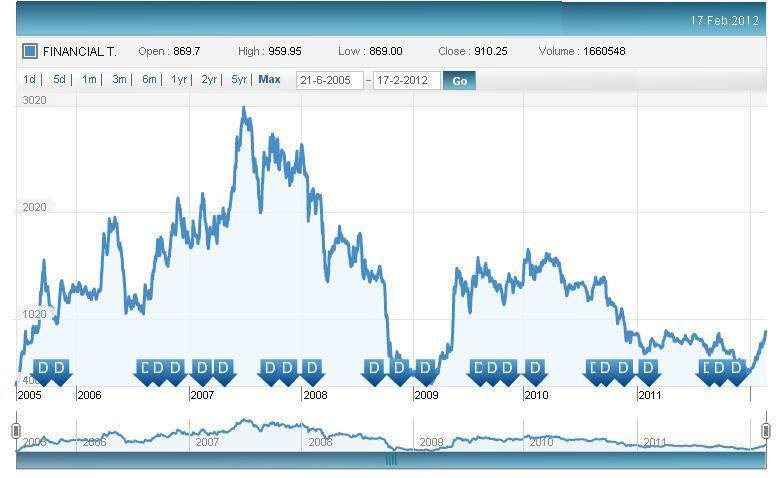 FT stock also fell in Dec 2011 to a low of 518, before recovering. Revenues have been inconsistent also. But current price reflects a P/E of 53 times. The PE is high because FT has been a very innovative company, to have created the MCX platform, and taken leadership position in a very knowledge intensive, and high potential industry of CT.
FT has also taken its capabilities to new markets, to set up a network of 10 exchanges and 5 ecosystem ventures, connecting growing economies of Africa, Middle-East, India and SouthEastAsia. A quick view of figures 2 & 3 reveals a transfer of business from Promoter FT to spin-off MCX. This is positive for the new entity. IPO shares sale is by shareholders like FT, State Bank of India, GLG Financials Fund, Alexandra Mauritius, Corporation Bank, ICICI Lombard Gen. Insurance Co and Bank of Baroda. There is no fresh issue of equity, so MCX will not get any money through this IPO. CRISIL has assigned a grade 5/5 to the IPO, indicating strong fundamentals. 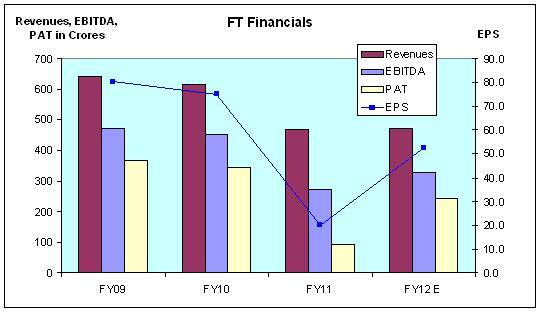 By current projections, IPO pricing PE ratio is 15 to 18 times of FY12 earnings. Why does MCX need to do an IPO? FT, the promoter, holds 31% in MCX, and has to dilute its stake to 26% in MCX to conform to guidelines prescribed by the commodity markets regulator, Forward Markets Commission. FMC is part of Ministry of Consumer Affairs, Government of India. Other shareholders mentioned above are early investors looking for an exit route. Was there any legal issue/ court case around MCX or FT? FT/MCX have faced a series of litigations from SEBI, FMC, etc on aspects like corporate structure, Promoter holding and Trading permits. However these are mostly resolved. They were also necessary as a Commodities Trading platform in India is a critical infrastructure that can affect (and of course improve :-)) lives of crores of farmers/ agro based workers, commodity consumers, etc. Other litigation pertain to transaction level issues, which are inevitable as trading and discipline are introduced into new sectors, new commodities and new producers and consumers. MCX is available to investors at a PE of 15-18 compared to FT PE of 53. This is a massive discount. It is reasonable to expect the high PE of FT to rub off on MCX. This is among the largest IPO offers in the last year. There has been an improvement in investment climate & sentiment in India from Dec’11. The IPO is testing this new investment climate. It is believed that Retail as well as Institutional investors are waiting in the sidelines for good investment and entry opportunities. MCX is a pioneer in a new industry, provides a critical infrastructure and is a good independent business opportunity. It has an innovative, fast growing platform that not just dominates India but also is in global top 3 in several commodity categories. 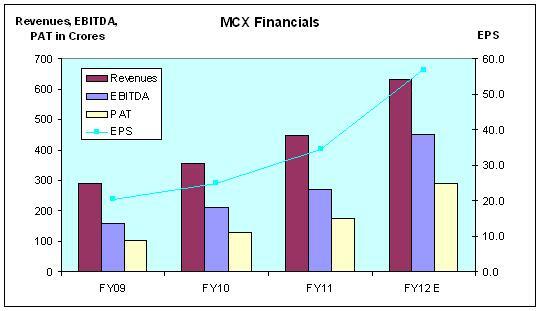 MCX has good management with global ambitions; firm is cash positive, profitable and growing fast. As a standalone entity it is attractive. FT should stay at arms length away from MCX and allow this firm to develop independently. Government controlled sector. There are periodic bans on commodity exports. The Indian Govt should allow CT exchanges and market to grow. Competition can intensify as some other firms have the backing of government, NSE, BSE, PSUs, etc. My opinion is that Commodities trading should be restricted to Producers, Consumers, Institutions and professional / specialist investors. Retail investors without specialized knowledge may burn their fingers, and give the CT business bad publicity. MCX is part of a new agri /commodities revolution in India, where trading can ‘disintermediate’ the commodities supply chain, reduce price inflation, enable better price realization for producers and reduce costs (and risks) in the system. That is if markets develop as expected :-). MCX is the dominant leader in this emerging business. It has a good management with global ambitions. The only reason for these discounts to be available to IPO investors is because MCX is testing troubled waters, as market sentiments have been poor in the past and some IPOs have even been cancelled recently. Also public resentment is high as IPOs from 2010/11 are running at discounts to IPO pricing. This is a very attractive investment opportunity. I expect this IPO to be a big success and get heavily oversubscribed. Also there should be a good appreciation of the share on listing. Conservative investors should watch subscriptions on 22-23 Feb and take a decision by 24th.